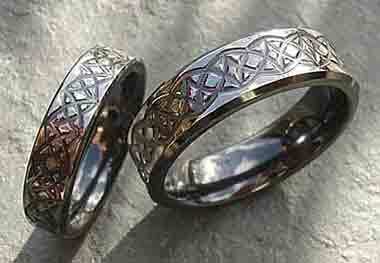 MEN'S CELTIC RINGS : BRITISH Made : LOVE2HAVE in the UK! The BEST! British made men's Celtic rings at the lowest prices online. Of all the Celtic rings for men we sell, our zirconium ones are the most Gothic, alternative and unusual of them all. Made from zirconium, they are heat treated to create the only all-black Celtic rings made in the UK. Not only do we sell all black, but a fantastic alternative in two-tone styling too, achieved by machine skimming away the treated black surface to create beautiful twin finish effects with the natural grey colour of zirconium. This technique works well on rings such as the Celtic outer laser engraved designs. If you are a fan of black rings, then do take a look at our men's wedding rings section, alternatively, try the Gothic rings listings. Some of our men's diamond rings are made from zirconium too that have an all black or twin finish surface. Finding a suitable ring for a man can be quite a problem, but all of these ranges fit the bill perfectly. On a final note we are very confident in that not only do we provide the BEST men's Celtic rings made here in the UK (and probably the world) but also at the LOWEST PRICES too. If you think you may have seen the same men's Celtic ring elsewhere at a lower price, let us know, and we will price match like for like. YES! We can BEAT anyone!